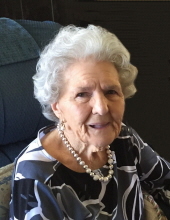 Waynesville, Lillian Hatherlee Norris, 87, passed away on Tuesday, October 30, 2018 at Autumn Care. A native and lifelong resident of Haywood County, she was the daughter of the late Lonnie and Ada Trull Hatherlee. In addition to her parents, she was also preceded in death by three brothers, Bud, Bobby and Dallas Hatherlee; a sister, Ruth Gibson; and one great-great-granddaughter. Lillian enjoyed camping, cooking and sewing and was a member of Calvary Road Baptist Church. Lillian is survived by her husband of 71 years, Joseph Glenn Norris; two daughters, Shirley Dean (Ronnie) and Judy Stamey (Jerry) of the Bethel Community; two sons, David Norris (Barbara) of Brevard and Jim Norris (Linda) of Waynesville; 12 grandchildren; 15 great-grandchildren; and 3 great-great-grandchildren. Funeral services will be held at 2:00 p.m. on Saturday, November 3, 2018 in the Waynesville Chapel of Wells Funeral Home with Reverend J.D. Grant and Reverend Dr. Roy Kilby officiating. Burial will follow at New Cruso Cemetery. The family will receive friends from 12:30 until 2:00 p.m. prior to services at the funeral home.